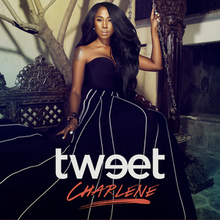 Charlene is the third studio album by American singer Tweet. It was released on February 26, 2016, by eOne Music. "Won't Hurt Me" was released on September 21, 2015, as the album's lead single. The second single "Magic" was released on January 21, 2016, followed by "Neva Shouda Left Ya" on February 11, 2016. Rolling Stone listed Charlene as the 12th best R&B album of 2016. Tweet left Missy Elliot's record label in 2007 shortly after the release of It's Me Again. However, the pair reunited during the recording process of Charlene. In 2007, Tweet departed from longtime friend Missy Elliott's The Goldmind Inc. label and signed to Jheryl Busby and Mike City's record label, Umbrella Recordings. There, she began recording material for her third album along with producers Nisan Stewart, Warryn Campbell and Novel. Tentatively titled Love, Tweet, the album was preceded by the buzz single "Good Bye My Dear", a collaboration with rapper T.I., and expected to be released on April 8, 2008. However, the release of lead single "Anymore" failed to materialize. In 2010, Tweet parted ways with Umbrella due to lack of promotion and ongoing delays. In September 2011, Tweet signed to MC Lyte's record label DuBose Music Group. In June 2012, she began posting previously unreleased material from the It's Me Again and Love, Tweet recording sessions on her new website as a part of her weekly SoundCloud-hosted special, Tweet Tuesdays. She released an extended play titled Simply Tweet on February 26, 2013, through DuBose. The EP reached the top 30 on both the US Billboard Independent Albums and the Top R&B/Hip-Hop Albums charts. After heaps of label troubles when Love, Tweet was shelved, in July 2015, Tweet confirmed that she had signed with the independent eOne Music label and confirmed that a new album was to be completed and released. Initially slated to feature vast production credits from Elliott and expected to be released on January 22, 2016, Charlene was pushed back to February 26, 2016, with further retooling and added contributions from other producers such as longtime collaborators Craig Brockman, Charlie Bereal, Nisan Stewart, and Timbaland. 1. "Intro: Soulfully Yours, Charlene"
5. "Interlude: All I See Is You"
8. "Neva Shouda Left Ya"
11. "Interlude: Will You Be Here"
14. "I Was Created for This"
"Somebody Else Will" contains a sample from "Be Pavadinimo (Untitled)" written and performed by Giedrius Kuprevičius. Credits adapted from the liner notes of Charlene. ^ "Won't Hurt Me – Single by Tweet". iTunes Store (US). Retrieved October 25, 2017. ^ Breezy, Elle (January 21, 2016). "Tweet Releases New Single & Reminds Us Why She's 'Magic'". Singersroom. Retrieved October 25, 2017. ^ "New Music: Tweet – Neva Shouda Left Ya". ThisIsRnB. February 11, 2016. Retrieved October 25, 2017. ^ Sargent, Jordan (December 14, 2016). "20 Best R&B Albums of 2016". Rolling Stone. Retrieved November 3, 2017. ^ a b c DJ Z (October 18, 2007). "Tweet, Set to Release 3rd Album, "Love, Tweet"". DJBooth. Retrieved March 2, 2016. ^ "New Music: Tweet Feat. T.I. – 'Good Bye My Dear'". Rap-Up. October 9, 2007. Retrieved March 2, 2016. ^ "YouKnowIGotSoul Interview With Tweet". YouKnowIGotSoul.com. October 21, 2010. Retrieved March 2, 2016. ^ MC Lyte [@mclyte] (September 23, 2011). "DuBose Music Group signs TWEET @ms_hummingbird & JGUNN @JGunnisbetter @DuBoseJ LET's GO!!!" (Tweet). Retrieved March 2, 2016 – via Twitter. ^ "DuBose Music Group". SoundCloud. Retrieved March 2, 2016. ^ "Tweet Releases New EP "Simply Tweet" Today". YouKnowIGotSoul.com. February 26, 2013. Retrieved March 2, 2016. ^ a b "Tweet Chart History (Independent Albums)". Billboard. Retrieved December 10, 2016. ^ a b "Tweet Chart History (Top R&B/Hip-Hop Albums)". Billboard. Retrieved December 10, 2016. ^ a b "Tweet Interview: Tweet Talks Signing To eOne Music, New Album, Working With Missy Elliott". YouKnowIGotSoul.com. July 15, 2015. Retrieved February 27, 2016. ^ Kellman, Andy. "Charlene – Tweet". AllMusic. Retrieved February 27, 2016. ^ "Charlene [Only @ Best Buy] [CD]". Best Buy. Retrieved February 12, 2016. ^ "Tweet Chart History (Billboard 200)". Billboard. Retrieved December 10, 2016. ^ "Top R&B/Hip-Hop Albums – Year-End 2016". Billboard. Retrieved December 10, 2016. This page was last edited on 19 November 2018, at 00:30 (UTC).